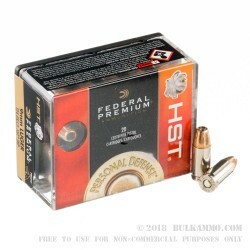 A fine ammo for 9mm defensive uses, this is a duty capable load in the proven Federal Premium with Hydra-Shok line; which offers excellent stopping power in a medium weight (124 grain) 9x19 cartridge. A 124 grain projectile in the brass case, with a Boxer primer. The case is nickel plated for feeding improvements and better facilitation of extraction as well as to keep the brass cleaner and easier to process for reloading. The Hydra-Shok bullet is a well-known and law enforcement duty proven projectile that gives incredible performance in gelatin tests. The penetration is adequate without being overbearing, the energy on target is sufficient for one shot stops and the consistent mushrooming effect of the bullet allows for a large wound channel. Very clean powders makes this Federal Premium round further worthy of its name, given the harmony of several premium components. 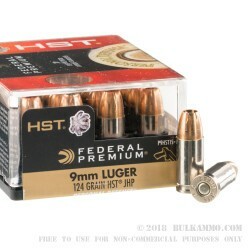 This particular powder is substantially cleaner than most other 9mm rounds, including most of the high end duty rounds. Delivering 1150 feet per second at the muzzle with a moderately heavy hitting 365 ft. lbs. of energy, this is a very solidly performing 9mm load. 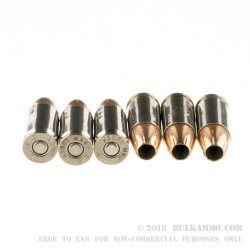 It is suitable for feeding and reliable use in all 9mm firearms.